Being able to sit and move in a relaxed way; that is what you would ideally like your wheelchair to provide for you. Pain-free mobility that enables you to expand your horizons. That is exactly what our new ActivRelaxHopper offers you. You no longer feel uncomfortable or awkward in your own wheelchair. You see, you increase your day-to-day options and engage in more activities with the help of the ActivRelaxHopper. In other words: the ActivRelaxHopper is a wheelchair that offers you more opportunities. 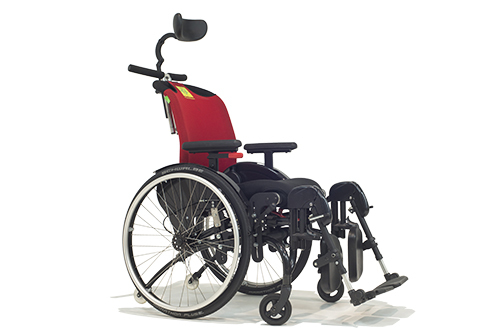 In addition to mobility, the versatile character of this wheelchair offers you freedom! The ActivRelaxHopper offers effective and reliable posture support at all times and during all activities. The ActivRelaxHopper enables you to expend energy more efficiently. The seat and backrest of the ActivRelaxHopper can be adjusted independently of each other. This means you don’t need to use as much force, causing less joint pain. Loss of strength and joint pain will be a thing of the past as soon as you start using an ActivRelaxHopper. Thanks to the ActivRelaxHopper’s spring support system, it is easier for you to get out of your wheelchair. The integrated anti-tip guarantees your safety. Thanks to the Air breathable backrest cover, you are less likely to feel hot. Our 3D body scan allows us to customise your wheelchair exactly according to your measurements.